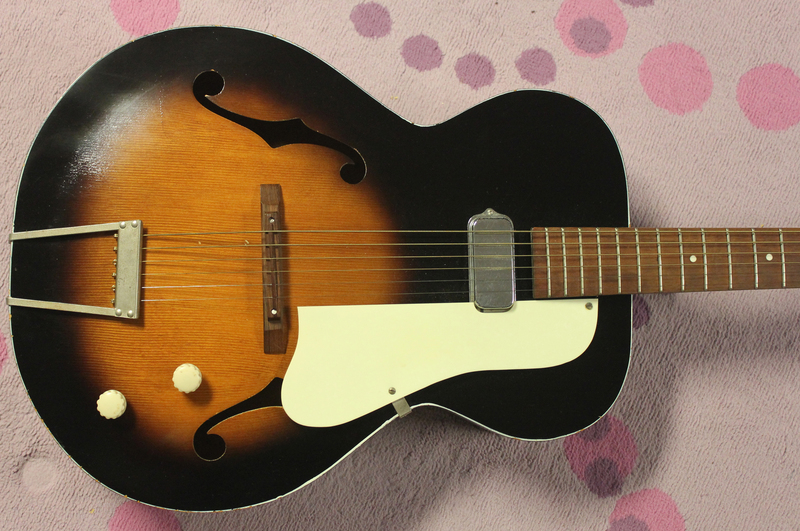 1959 Kay Value Leader (K6533) Electric Hollowbody Guitar – Drowning in Guitars! Back in the 1950s, big ‘ol hollowbodies like this were really popular! Bridging the gap between acoustic guitars and solidbody electrics, these hollowbodies sounded really great for jazz, swing, rockabilly, and dark blues. Beginning in 1959, Kay introduced this lower-priced model. 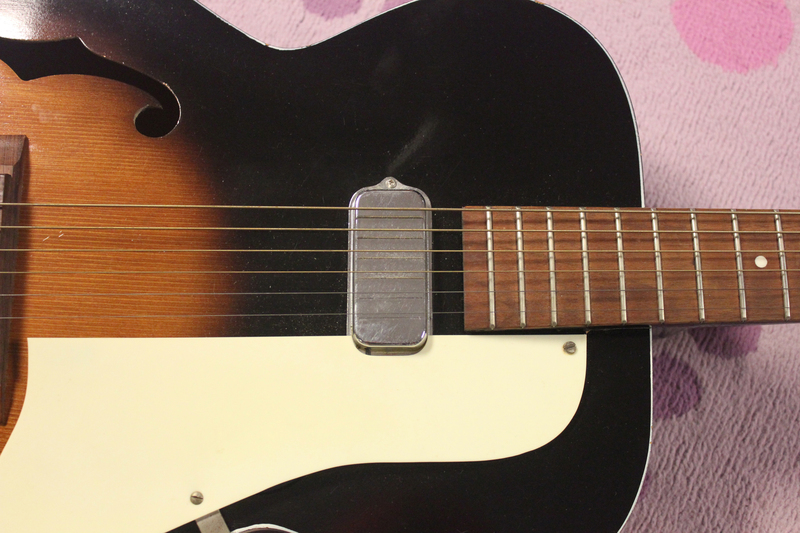 That single pickup was appearing on many Kay guitars beginning in the 1950s, and the simple controls and low price ($59.95) made this a good choice for a beginning guitarist. The Gibson ES125, which also featured a full hollow body and one P90 pickup, was a similar model but priced closer to $100 in the late 1950s. Of course, there were several differences in construction, and sound. A cool feature of these old full hollows is that they can really pack a punch! The acoustic properties can give a snappy sound, and volume like a cannon! But the downside is that one neck pickup is somewhat limiting. Many modern players like Jack White use these for slide playing. The near-constant string contact limits feedback, and the neck position pickup can mellow out the sharp bite of a slide. See that striping on the back and neck? That’s not actually wood figuring! It’s paint! Kay painted those stripes on the body to give these a sophisticated, upscale look. Like it was a much more expensive guitar. But these were inexpensive in their time, and their inexpensive now. A really good bargain in vintage guitar land! The wood portions of these guitars hold up well with the passage of time. As long as they weren’t exposed to extremes in temperature and humidity, these old Kays were durable. But Kay used very poor frets on most of their guitars, and I see many that need neck resets. Many players would consider the neck profile a “baseball bat”, but I really don’t think it’s that bad. Neck profiles just thinned out as the 1950s wore on, and by 1959, Kay necks felt really good! There wasn’t a truss rod in these Value Leader necks, so there’s usually some extra set-up needed. But again, playing slide is a good way around a bad neck angle. 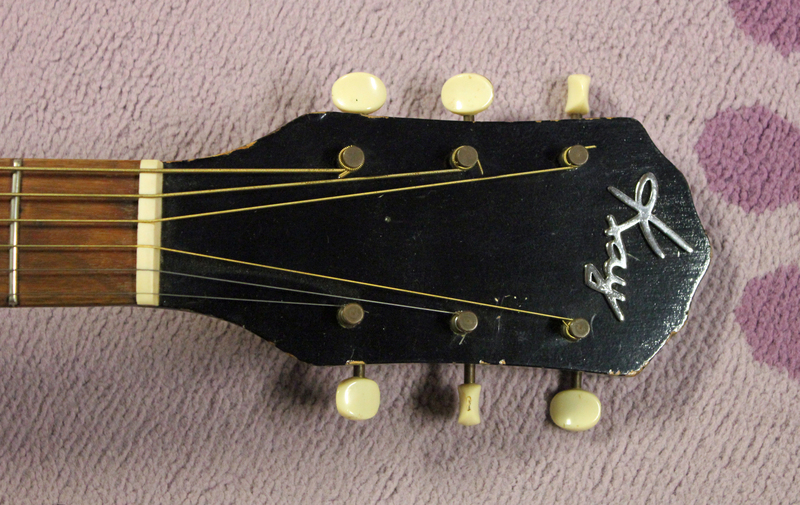 By 1960, Kay was offering more thinline models, which were also labeled at Value Leaders. This K6533 model seemed to only last a few years and was gone by the early 1960s. But when you want “that” sound, this is the only way to go. As usual, Happy Guitar Repair did all the work on this guitar, and Mike Dugan does all the playing in the video. Enjoy! Love it! I picked up one of these at renningers back in the early 90s and it may be my favorite guitar for tone..and punch.. I will forward you a pic.. I have the single cutaway mid 60s model ( I believe ).. Have to look up model number again.. Great sound / looks cool as hell. Again, love your site and all the great info and pics! Sorry man, this one’s not for sale. Do you think you’d ever consider selling it? Behind you in the picture is what looks like a kent with four pickups is that correct and if so would you sell it ? Sorry Tom, that was sold. It was a Demian guitar. But I do always have guitars for sale if you’re interested in others. I had a Kay hollowbody exactly like the one shown, except mine had two pickups with a chicken head switch. Can’t remember if it had separate tone and volume knobs. Got it with S&H Green Stamps around 1966, out of pocket cost was sales tax. Played it thru a Kent tube amp, one of the ones with tremolo. I believe it was 40w. Cost forty bucks, I do remember that. Sold ’em both to a family friend for $100 so I could buy an EKO Ranger XII twelve-string for $150. Oh my, thanks so much for sharing. That’s an awesome story!!!!!!! Outstanding, thanks for the history; I have two of these from a relative’s attic, and was wondering how old they were. One has the original warranty papers still tied to the neck, and hand-written in black crayon: ‘K6533’ on the tag; I can find no finger or string marks on the bridge or anwhere to indicate it has ever been strung. Has some minor light scratches on the back where it was laying in the attic, but otherwise is just dusty. I’m not a guitar expert, but do buy/sell antiques, and have an eye for cool stuff. What do you think, worth anything? Oh sure it’s worth something. These are good guitars, pretty well built, and constructed in what’s considered the golden age for electric guitar manufacturing. But years in an attic might have affected that guitar in all sorts of ways. Of course in my eyes, everything is salvageable! I have one very similar to this, Only difference it has 2 pickups and it says OLD CRAFTSMAN on the crown with a bell shape plastic near the top of fret board. Are they connected or related ? I know nothing about this guitar except that I bought it in 1970 at a swapmeat from an elderly man playing the blues ! thank you for any info. Yes, they are related. Most of the Old Craftsman guitars were made by the Kay company. Love this guitar. I live in England and can’t seem to find a guitar like this anywhere. Any ideas of good places to look. I have my father’s old Kay guitar which appears to be similar to this but has 2 pickups & what appear to be ivory guitar pick inlay fret markers on the fretboard. Needs a serious neck reset though. Yours sounds great. I’ll try finding a luthier in this neck of the woods (Canada) though & see if it’s worth repairing. Oh yeah, almost all the old Kays eventually need a neck re-set. Good luck on the tech hunt, and if it was your dad’s guitar, then I think you should definitely get it restored! That’s really great you still have his guitar. Tough to say, prices seem to be up and down at the moment. I am located in Virginia and I am having trouble finding one, do you know where I can possibly buy one? And would you ever consider selling this one? 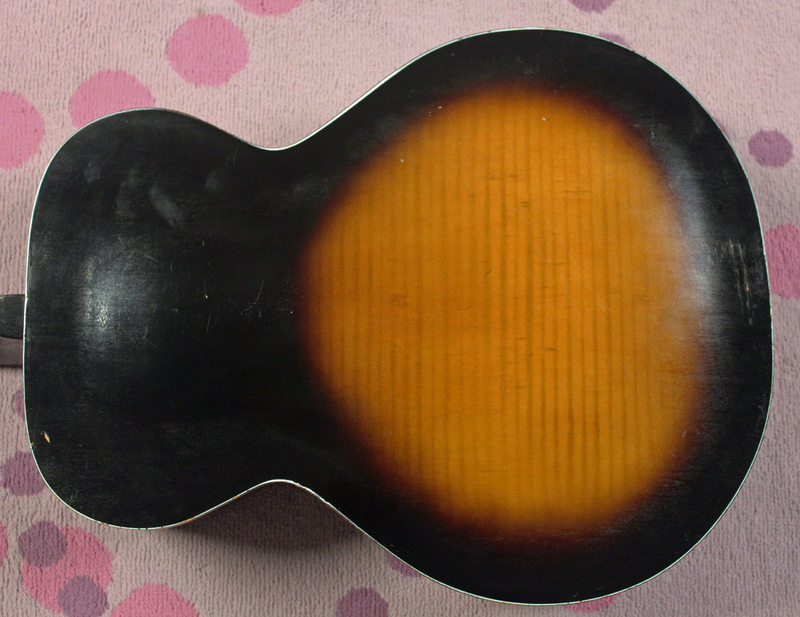 I am scoring a 3 pickup value leader solid body (actually hollow) It is in great shape neck seems fine. I am wondering about those pancake pickups. Are they dearmonds? I hope so!